Architecture is harder to define than you might think. The good people over at Encyclopedia Britannica define it as both the process and the product of planning, designing, and constructing buildings or any other structures. But architects themselves define their craft in at least 121 different ways and the strategies and processes they employ are just as diverse. Brand architecture is not so different. To give a baseline definition, brand architecture describes how a business organizes, manages, and markets their brands. Like with architecture, there are many different approaches to brand architecture—each impacting how people will perceive your business, how a new product or service is launched and how other brands are integrated. Choosing the right brand architecture to match your products or services and your business goals is a key component to building a strong reputation. The most tried and tested approaches fit into the categories of a branded house, a house of brands and a hybrid model. Read on to see how these three models compare and which method could work best for building your brand. With a Branded House approach, the parent or master brand is always present and linked to all products and sub-products. This approach gives you consistency, simplicity and the ease of management compared to other brand structures. There is only one set of branding elements and the focus is always on one brand. A good example of a company using the branded house approach is cosmetics giant Aveda. They make a variety of hair, skin and body care products that all carry the parent branding. An advantage of a branded house approach is that it promotes the acceptance of new products launched using that brand name. These brand extensions reduce consumer risk and usually lower the cost of marketing programs. Each product benefits from the brand reputation of the master brand. If you like one of the products Aveda makes, then you will likely have more trust and be more likely to purchase a similar product from them. This branded house approach does have drawbacks you should keep in mind. The first of these drawbacks is brand dilution. A strong brand extension will often increase overall brand equity. But a bad product or service experience can corrupt the entire company’s offering—causing an overall reduction in brand equity. If you have a bad experience with an Aveda shampoo, you may be less likely to try their face cream. A brand extension also usually has to have a logical association between the original product and new item. A collection of Aveda beauty accessories would fit within Aveda’s master brand, but a line of frozen pizzas would leave people scratching their heads. In the house of brands architecture, each brand stands on its own. This structure encourages creating and building independent sub-products and their brands, while the parent brand directs off-screen. Unilever has a brand portfolio that includes food, beverages, cleaning agents and personal care products. It’s would not be unusual for someone to have Dove soap in their bathroom and Ben & Jerry’s ice cream in their freezer without knowing that Unilever even exists. Both are major brands that achieve billions in sales in their respective categories. Within the house of brands architecture, they are considered both sub-brands of Unilever. Separating brands in this way allows each product and service to be distinct from each other. Each brand tells its own unique story, enabling you to be strategically flexible to go after a clearly defined market and ideal target customer. This approach also lets the parent brand easily diversify their offering and acquire other brands without the need to rebrand. Unilever could create or purchase a solar panel manufacturer with little to no impact on their other brands. The time and financial cost of strategy, identity and marketing activities do increase when creating brands from scratch. These brands also don’t benefit from the brand equity boost that would normally accompany a sub-brand from a branded house approach. The hybrid brand architecture is a mixture of the different brand organizing strategies. The advantage of this approach is the ability to employ the individual brand strategies and sub-brand hierarchies that make the most sense for your product or service. There is this small company called Amazon that has been known to use the hybrid approach. They use a corporate branding strategy that leverages the brand equity of parent brand to promote their first-party products like the Amazon Echo and Amazon Kindle. 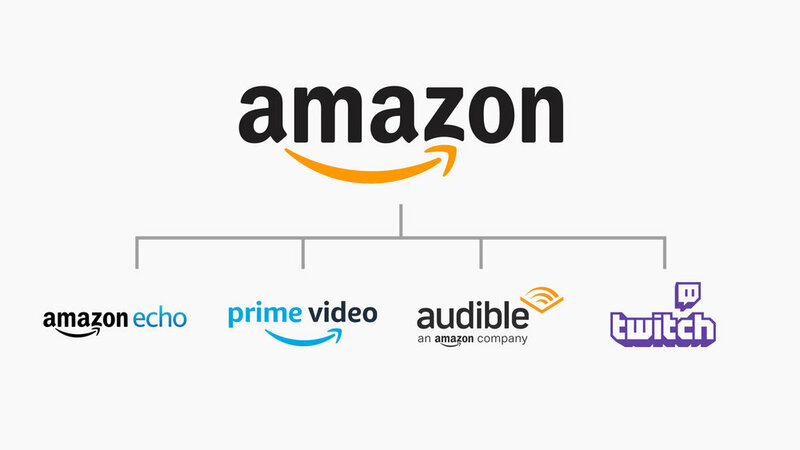 Amazon services like Prime Video are sub-brands of their membership program Amazon Prime. Audible is an endorsed brand that leverages its Amazon connection, but stands enough on its own to have its own unique identity. Twitch is a video streaming platform that was acquired by Amazon. They chose to keep the same brand identity which allowed the ownership transition to be seamless for their users. As you might have noticed, it can become confusing to keep track of each brand and how it fits within the overall structure. Adding confusion to the equation is not ideal for making customer’s choices easy. The hybrid model can also promote a lack a branding consistency that makes products like Apple’s iPhone XR and iPhone XS Max the subject of public ridicule. Making the hybrid model your approach will come with all the benefits and hindrances of the other models, so careful brand management will be crucial to maximizing returns. Which brand architecture is right for your business? Keep in mind that brand architecture is not limited to large multi-national corporations. Any business that wants to develop their brand and organize their offerings can evaluate which brand architecture strategy will support future growth and success. Ignoring brand architecture could put your brand equity at risk—impacting your bottom-line. There is no one-size fits all approach. But with targeted research and a well-defined strategy, you can build a strong brand that delights customers and sets your business apart. Want to learn more about crafting a brand architecture that positions your business for success? We’d love to help.